The Meadowridge Library is designed for learners to work individually and collaboratively in the pursuit of learning and understanding. Our community has access to a growing collection of over 31,000 resources, including books, periodicals, DVDs, and online databases. There is also a network of technological support, including three computer catalogues and computer work stations, which provide access to the library catalogue and subscription databases. 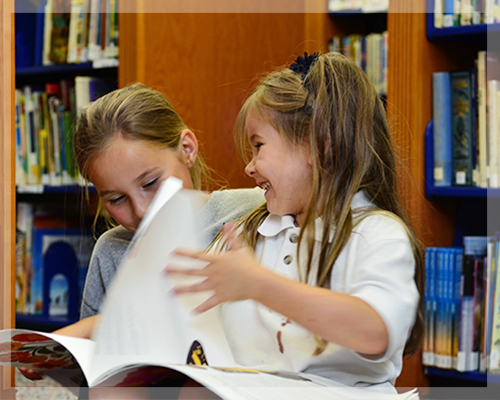 Our learners are supported by two teacher-librarians, one library technician, and many dedicated parent volunteers. Our teacher-librarians collaborate with our faculty with the instruction, development, and planning of units and research assignments. Students have an opportunity to sign up for this club as part of their Community, Activity and Services (CAS) time. The three strands of CAS are characterized as follows: Creativity – arts, and other experiences that involve creative thinking. Activity – physical exertion contributing to a healthy lifestyle, complementing academic work elsewhere in the DP. Service – an unpaid and voluntary exchange that has a learning benefit for the student. Please contact the library for further information. It is held Thursdays during the Term 1 and Term 2 CAS Club. Activities include shelving, checking in books, tidying, helping library patrons and much more! Please contact the library for further information. Reading Link Challenge is a province-wide program for students in grades 4 and 5 that promotes the "sport of reading." The program is run as a series of quiz/trivia challenges with winning teams advancing to higher levels of competition. Participating children learn about teamwork and how to read for retention. Reading Link Challenge also promotes public library usage and encourages children to develop a lifelong habit of reading for pleasure.